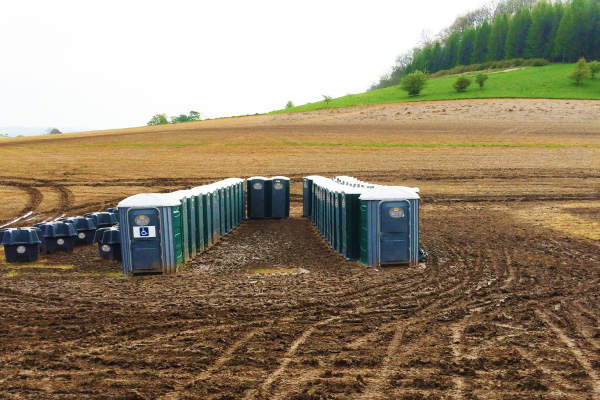 To facilitate our chemical toilet servicing we have a fleet of tankers and a team of dedicated service drivers with years of experience in liquid waste removal. All of our drivers are NSQ (National Sanitation Qualification) qualified. This specific training means they are the most qualified waste disposal service operators in the UK. We have a large fleet of vehicle enabling us to carry out your chemical toilet servicing. Our most popular truck for chemical toilet servicing are our Mercedes Sprinter which are custom fitted with bespoke 300 gallon vacuum tanks. These trucks are also fitted with hazard lights so they can navigate through crowds safely to service chemical toilets at your event, which is required by Health and Safety. It is a popular option at large festivals and high attendee events for us to use the Mercedes Sprinter to feed into our larger tanker or into our waste holding tanks for later disposal. Allowing us to save time and use that time to ensure all toilets are kept at the highest possible standard. Our biggest tanker is 2000 gallons driven by a HGV qualified driver for larger events, and for mid-range emptying we have a 7.5 tonne servicing vehicle purpose built to dispose of 500 gallon worth of liquid waste. Meaning less trips and can be more cost effective. Lastly to complement the fleet we have smaller 4×4 vehicle’s for rougher terrain, such as army land, and off roading with a 100 gallon vacuum holding tanks. Chemical toilet servicing includes emptying waste tanks, replacing chemicals and replenishing items such as soap and hand towels. All waste is safely disposed off at the nearest water utility. You can see our waste carriers license here we can also issue a waste transfer note to organisers that require this documentation.